Specifically designed to seamlessly address the combined personal and commercial exposures uniquely associated with Farms. Covers anything connected to the internet including the following Internet of Things exposures: Cloud based storage, GPS equipment, harvesters, drone guidance systems, planting and seeding systems, application controls, yield monitoring, water management data storage systems, wireless networks for soil testing, and hydration and crop measurements; except as addressed by product warranties. 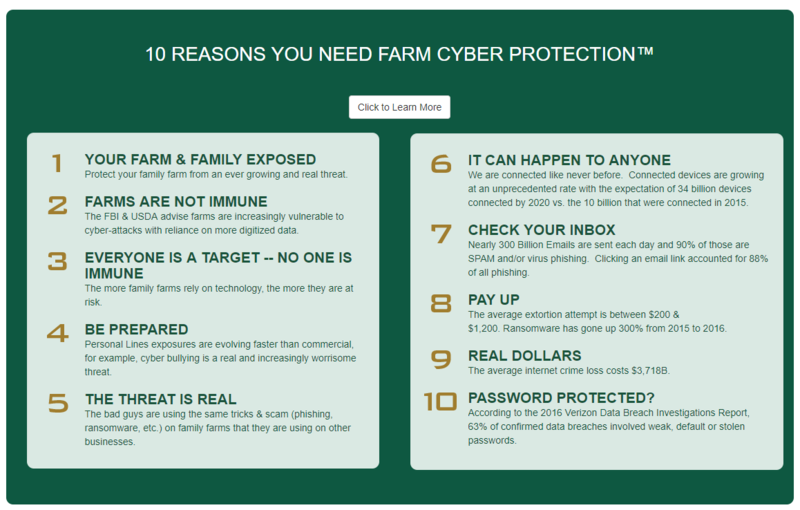 Farm Cyber provides the standard business coverages that should be part of any commercial cyber product. Expenses or ransom paid for threats to create a home network disruption or a privacy breach.